With all of the Japanese characters on the box, the game might seem foreign and be pretty mysterious. The fact is, the game is a very easy to learn, quick to play, push-your-luck style dice game. 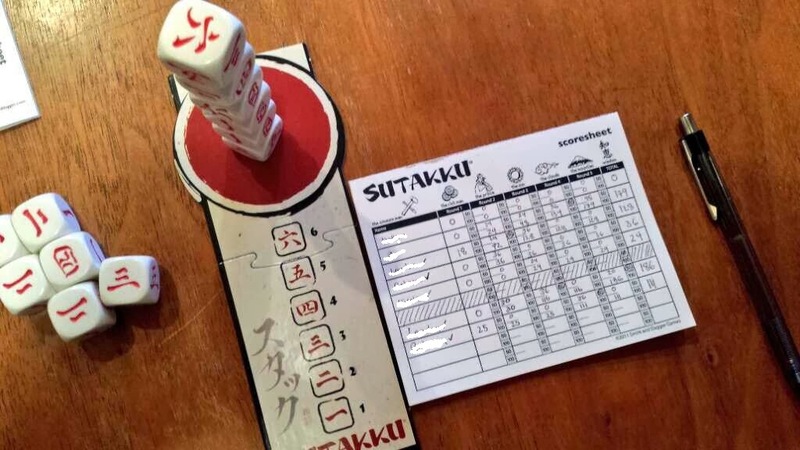 Fans of Yahtzee, Farkle, Fill or Bust, or Incan Gold are those most likely to enjoy SUTAKKU. The symbols on the dice may be a little intimidating at first, but they just represent numbers with the Japanese characters. The game is really simple, elegant, and fun. The star of the game (as it should be) is the set of 12 beautifully engraved large (3/4") dice. These dice are awesome! Top notch quality. The bigger dice are perfect for stacking (and yet not too large to make rolling them awkward) and for good visibility around a big table. I repeat, these dice are awesome. The game also comes with a little black cloth dice bag, a stacking/reference board, a score pad, 11 'Smirky's Challenge' bonus cards, and rule book. cool. 2) Center a spot where the dice will be stacked. 3) Provide a reminder to what the Japanese characters represent. You could create a house rule that involves the board (as suggested in my video) when dice fall from an in-progress stack, but in general the board is their to look cool - and it does a great job. The cloth bag fits all 12 dice for convenient pocket travel. The score pad is nice and there is a blank copy in the rule book so you can make additional copies (smart idea). The rule book is nice and even includes a little Japanese folklore story that gives some background for the origin of the game. The bonus 'Smirk's Challenge' cards are a great idea and I like playing with them. I am disappointed however in the quality of these little 'bonus cards.' I would have loved for these cards to be more 'poker card' type quality, but they are basically printed on card stock paper. They are considered to be just a little bonus to the game, but I really would have liked to see them included more as a part of the game and the quality increased. Without getting too detailed with rules, the game really consists of rolling 3 dice and stacking 2 of those dice onto your scoring stack. These 2 dice must be equal to or greater than the top die of the stack and if you can't stack 2 of your 3, you bust - losing all your points for this turn. While you have one free mulligan per turn to re-roll 2 of your 3 dice, you must be careful not to get too greedy. You get bonus points for stacking on 5s, 6s, or if you are able to stack all 12 (which would be amazing!). That is the game! Simple and yet extremely fun. You can add in the challenge cards which really makes the game interesting. It will basically set a challenge to a player that that player must complete to score any points - and yet the player may get rewarded nicely by doing so. A nice element to the game (again, I wish there was a bit more of). I really enjoy SUTAKKU and it has been well received by friends and family. The game is a very light dice game and with that comes very little strategy. The real decision you have to make throughout the game is if you will be pressing your luck to try and obtain some major points, or if you will keep the small points and stay safe. Then, there is always the last round or so for those who are so far behind that they will always push their luck trying to score big - and they just might. I like the gameplay and I really enjoy the larger dice in this game. Great quality and they look cool. I also enjoy playing with the challenge cards although I wish they were a little bit better quality. The actual game could really be played with any regular dice, so you will be purchasing this game mainly for the artistic large dice, stacking board, written rules, travel bag, and the challenge cards. That said, I'm giving the game 4 Fingers Up or 9/10 stars because I enjoy the simplistic game and the dice are fantastic and that is How Lou Sees It! A big SHOUT OUT to Smirk and Dagger Games for making this review possible. Stay tuned for future Smirk and Dagger game reviews (Dread Curse, HEX HEX XL, and Cutthroat Caverns).